Mels Box of Chocolates: It's Stinking Hot! 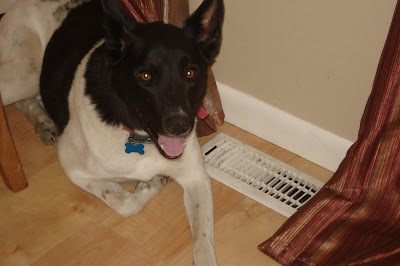 who has not left this comfy spot on top of the air conditioner vent the last few days!! oh my gosh, I totally feel your pain! it is ridiculously hot here too. trying to get abe out to a playground is not possible. Thank God for Mc D's and Chickfila's inside playground! It's SOOOOO hot and humid here in IL too! We do a lot of book reading and dart out to the car to take a ride -- at least we get some fresh sunlight, even if we don't really get much fresh air -- don't really know how 'fresh' it is these days.....I am short of breath walking out to my car from work....too much humidity!